American Academy of Ophthalmology reiterates the importance of dilated eye exams in preventing vision loss...This is especially timely as the Academy is reiterating the importance of eye exams during the month of November, which is observed as Diabetic Eye Disease Awareness Month. Newswise, October 26, 2016– People with diabetes are at increased risk of developing serious eye diseases, yet most do not have sight-saving annual eye exams, according to a large study presented at AAO 2016, the 120th annual meeting of the American Academy of Ophthalmology. This is especially timely as the Academy is reiterating the importance of eye exams during the month of November, which is observed as Diabetic Eye Disease Awareness Month. Researchers at Wills Eye Hospital in Philadelphia have found that more than half of patients with the disease skip these exams. They also discovered that patients who smoke as well as those with less severe diabetes and no eye problems were most likely to neglect having these checks. One in 10 Americans have diabetes, putting them at heightened risk for visual impairment due to the eye disease diabetic retinopathy. The disease also can lead to other blinding ocular complications if not treated in time. Fortunately, having a dilated eye exam yearly or more often can prevent 95 percent of diabetes-related vision loss. 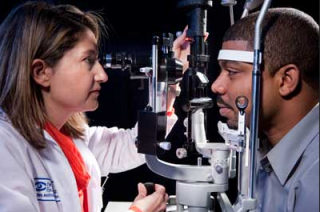 Eye exams are critical as they can reveal hidden signs of disease, enabling timely treatment. This is why the Academy recommends people with diabetes have them annually or more often as recommended by their ophthalmologist, a physician who specializes in medical and surgical eye care. The Academy has released a new animated public service announcement to help educate people about the importance of regular exams and common eye diseases including diabetic retinopathy. It encourages the public to watch and share it with their friends and family. American seniors 65 and older may be eligible to get a medical eye exam at no cost through Eye Care America, a public service program of the Academy. For more information about diabetic eye disease, visit the Academy’s EyeSmart website. Nonadherence to Eye Care in People with Diabetes was presented at AAO 2016, the 120th annual meeting of the American Academy of Ophthalmology. The event was held in conjunction with the Asia-Pacific Academy of Ophthalmology Oct. 14-18 at McCormick Place, Chicago. Known as the place "Where all of Ophthalmology Meets™,” the Academy’s annual meeting is the world’s largest conference for eye physicians and surgeons. For more information, see AAO 2016 highlights. Daniel Hines is an international-award winning communicator with extensive experience as a senior-level communications executive with some of America’s leading corporations, and as the founder of his own communications consulting business since 1986. A graduate of Bradley University, where he was elected to the Phi Kappa Phi honor society for scholastic excellence, he has established TodaysSeniorsNetwork as a leading source of information for issues affecting an Aging America, as well as advocacy on behalf of successful aging. He is also a leading spokesperson and advocate on behalf of access by Americans to safe, affordable, personally imported prescription medicines as a bulwark against the predatory pricing practices of Pharma. Get Your Flu Shot, Or We All Pay The Price! Copyright 1999-2015 TodaysSeniorsNetwork. Simple theme. Powered by Blogger.